Because we’re running on AWS, we can easily scale our infrastructure to support surges in user requests, maintain a stable online payment service, and complete orders. Headquartered in Taiwan and founded in 2013, 91App builds mobile commerce applications for clients that manage inventory and content through the 91App website. 91App has more than 2,000 brands using applications that provide basic services such as inventory listings and shopping carts, and merchants are able to add more in-depth features. The 160-employee business aims to increase this to 3,000 brands in 2015 and more than 20,000 brands in 2016. 91App also provides analytics that enable merchants to track the performance of their 91App e-commerce applications. When conceptualizing, planning, and developing 91App as an e-commerce “app as a service” provider for businesses, founder Steven Ho decided to run the service in the cloud. 91App needed a cloud partner that could help the business differentiate itself from rivals that were more focused on building e-commerce websites. “We felt applications provided a better user experience in the early days of the mobile internet, and drove higher customer engagement and higher customer conversion rates,” says Happy Lee, chief product officer at 91App. “However, to realize these benefits, we needed an infrastructure that could deliver sustained, secure availability, and maintain performance at all times regardless of how many users were browsing or checking out from e-commerce services.” 91App also needed the infrastructure to be cost-effective so the business could be viable, easy to maintain to minimize the load on its lean technical team, and flexible to support peaks and troughs in usage. 91App considered running on Amazon Web Services (AWS) due to the cloud service provider’s track record of performance and innovation. The company’s founders also believed that the emergence of AWS from the world’s leading e-commerce provider, Amazon.com, gave the cloud provider a legacy and experience that the business could tap into when running its own e-commerce service. The stability of AWS would enable 91App to focus on application development and customer service rather than infrastructure maintenance, while the extensive physical and cloud security features employed by AWS would minimize the threat to sensitive information. A comprehensive user interface and development tools would enable 91App to add new AWS services as its offerings expanded, while AWS also delivered the redundancy and backup capabilities that would enable 91App to recover quickly from a service disruption. 91App established its first Amazon Elastic Compute Cloud (Amazon EC2) instance and Amazon Elastic Block Store (Amazon EBS) storage volume in February 2013 and developed its architecture from there. The business is now running a range of systems and workloads in its AWS architecture, including batch and queue processing, payment processing, a business management platform, a search engine, and shop websites. These are running in an infrastructure that now comprises AWS Identity and Access Management (IAM) to provide role-based access to AWS resources, AWS CloudTrail to provide an audit trail, and Amazon DynamoDB to deliver a fully-managed NoSQL database service. Amazon ElastiCache is used to accelerate performance of the most heavily used e-commerce application features and Amazon CloudFront delivers e-commerce application content to users in a wide range of markets with low latency and high data transfer speeds. 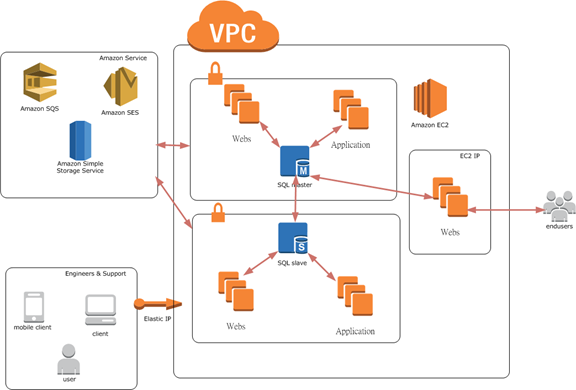 Amazon Route 53 routes users to appropriate resources within and outside the AWS infrastructure, Amazon Simple Notification Service (Amazon SNS) pushes notifications to users’ mobile devices, and Amazon Glacier provides long-term, durable storage for user and corporate information. The infrastructure resides with an Amazon Virtual Private Cloud (Amazon VPC) to protect sensitive resources and information from external access. 91App is using AWS Support, Developer-level to obtain assistance from technical support engineers and customer service professionals in AWS. Lee describes the support as “extremely helpful” in extracting as much value as possible from the products and features provided by AWS. Using AWS has enabled 91App to reduce the time required to create and launch digital marketing campaigns from what would have been several weeks in a physical infrastructure to an average of 24 hours with AWS. The ability to provision storage instantly rather than undertake a months-long procurement and installation process has also played a key role in 91App’s ability to create new test, development, staging, and production environments in hours. System availability levels at 99 percent complement this agility and assure merchants that their e-commerce systems will be available when they need them. Running on AWS has also enabled 91App to maintain a lean team and not add two more maintenance positions which would have been required if the business employed a physical infrastructure. The existing team can focus on innovation rather than infrastructure. “Using AWS has saved hundreds of hours in IT staff time and enabled us to use our engineers’ time more strategically,” says Lee. “We can deploy our team members on more strategic, revenue-generating projects rather than configuring servers and undertaking backup and maintenance activities.” The business has also gained double the processing capacity at half the infrastructure costs than would be required with an on-premises or collocated data center. AWS has also provided a platform to enable 91App to expand into South East Asia, where many people access the Internet exclusively through their mobile devices. This provides considerable potential for merchants to launch an e-commerce business using 91App-developed applications. “By using AWS, we can bring new environments up as fast as we need to in order to support growth. AWS is crucial to our success,” says Lee. To learn more about how AWS can help you run your website or web app, visit our Websites details page.